By 2060, the number of southern adults participating in each of 10 different popular outdoor recreation activities is projected to increase. Depending on future demographic, economic, land use, and population changes, the activity demonstrating the least growth in participants is hunting (8–25 percent). The activity projected to demonstrate the most growth is day hiking (70–113 percent). For many activities, participation will grow similarly to the population growth rate. However, the number of participants in fishing, hunting, and motorized off-roading will grow slower than the regional population, as a smaller proportion of adults are projected to engage in these activities. Conversely, the growth in the number of participants in birding and day-hiking is projected to exceed that of the population. By 2060, the number of days that southern adults will participate annually in each of 10 different outdoor recreation activities is projected to increase. The smallest increase in days of participation will be for hunting (8–24 percent), while the largest increase in days of participation will be for day hiking (77–116 percent). Days of annual participation for each of the 10 activities are projected to increase at rates similar to the growth in participant numbers. Acres of southern forest and rangeland per recreation participant will decline by up to 50 percent across the various activities by 2060. Acres per participant in hiking will shrink the most, while acres per participant for hunting will shrink the least. Annual user days per acre of forest and rangeland for recreation activities will increase most by 2060 for horseback riding on trails (up to 151 percent) and hiking (up to 118 percent) and least for motorized off-road use (up to 59 percent) and hunting (up to 34 percent). Depending on social and economic factors, southern national forest recreation visits are projected by 2060 to increase across all site types: Wilderness (38–72 percent), day use developed sites (35–70 percent), overnight use developed sites (30–64 percent), and general forest area (22–55 percent). Because southern national forest acreage is expected to stay approximately constant to 2060, visits per acre across the various site types will grow at same rate as visits. In this chapter, we address a small component of the question posed by Wear and others (2009) in defining the Southern Forest Futures Project, namely, “How will changing demographics influence associated demand for esthetic settings, recreation, and second homes?” We focus our analysis on projecting natural resource-based outdoor recreation demand at a broad regional scale, as well as at the regional national forest scale. In doing so, we hope to provide relevant information to “[e]valuate how population growth and changing demographics will affect changes in demands for different types of recreation activities, and explore implications for forest land uses” and “[e]xamine the potential for increased congestion and conflict among recreational users of forests as a result of changing supply and demand factors” (Wear and others 2009). Specifically, for the southern region through 2060, we develop and present projections of (a) the number of adult participants in 10 traditional outdoor recreation activities, (b) the number of days of adult participation in the same 10 outdoor recreation activities, and (c) the number of recreation visits to national forests in the southern region by national forest setting. An individual is said to have participated in an outdoor recreation activity if the individual reported engaging in that activity at least once in the preceding 12 months. Participation is a general indicator of the size of a given market and can also be indicative of relative public interest. For example, if over 80 percent of the population goes day hiking, whereas only 4 percent participate in snowmobiling, public resource management agencies and private land managers may be more concerned with providing hiking trails rather than snowmobiling opportunities. It is important, therefore, for land managers and legislators to know how many people participate in a given recreation activity, and how this measure could change over time. Measures of participation, either per capita or absolute numbers of participants, provide the broadest measure of a recreation market. A second measure of recreation use or demand is consumption. Consumption can be measured in such units as number of times, days, or trips in a given year. The Forest Service, U.S. Department of Agriculture, has used such consumption measures as recreation visitor days and national forest visits. A consumption measure is important because it adds another dimension to participation. Although resource managers providing recreation opportunities need to know how many people participate, many of their decisions depend even more upon knowing how often and for how long people engage in an activity. Such information can be critical to the allocation of existing resources, such as campsites, and is also useful in planning the development of new venues. Participation and consumption at the regional level together provide the broadest measures of a recreation market. The regional consumption measure used in this study [item (b) above] is the number of days in the previous year that an individual, residing in the South, reported engaging in a specific activity. A day in this case follows the definition given by the National Survey on Recreation and the Environment (NSRE) definition of an activity day, i.e., any amount of time spent on an activity on a given day, whether less than an hour or for several hours, whether that activity was the primary reason for recreating outdoors or not (USDA Forest Service 2009). The preceding two metrics are origin based, i.e., resulting from household-level surveying. There is no additional information as to where the respondent engaged in the participation for any activity. Research has shown, however, that the vast majority of outdoor recreation takes place within a few hours’ drive of one’s residence. Another metric, based on the destination rather than origin, is the on-site visit. In addressing item (c) above, southern national forest recreation visits by each of four different site types, Wilderness, day use developed sites, overnight use developed sites, and general forest area sites are used. Past outdoor recreation trends, as well as recent ones, are important indicators of what may happen with outdoor recreation in the near future (chapter 7, Hall and others 2009). However, simple descriptive statistics or trends do not formally explore underlying factors and associations which may be driving these trends. Thus a trend may be of limited value if the time horizon is long and factors driving the trend are expected to deviate substantially from their historic levels. Trend analysis can therefore be supplemented by development of projection models which attempt to relate recreation participation directly to factors known to influence this behavior. The projection models can then be used to simulate future participation by combining external projections of relevant factors, including population growth, with estimated model parameters. Such modeling allows changes in recreation participation and consumption behavior over time to be assessed in light of previously unseen changes in factors driving this behavior, e.g., large changes in demographic, economic, and land use factors. Previous research (Bowker and others 1999, Bowker and others 2006, Cicchetti 1973, Hof and Kaiser 1983b, Leeworthy and others 2005) has established that factors including race, ethnicity, gender, age, income, and supply or proximity to settings affect outdoor recreation participation as well as the participation intensity or consumption. Similarly, these factors along with others, including distance and quality descriptors, have been used to explain visitation to specific sites (Bowker and others 2009, Bowker and others 2007, Englin and Shonkwiler 1995). Reliable information about these factors is often available from external sources, like the U.S. Census or parallel research efforts aimed at modeling and simulating influential variables into the future. Such information can thus be available long before recreation survey results can be obtained. A two-step approach was used to develop projections for participation and consumption of 10 traditional outdoor recreation activities (see table 8.1). The first step, or model estimation step, focused on the development of statistical models of southern adult per capita participation and days of participation (conditional on being a participant) for each of the activities. The statistical models first represent the probability that one participated in an activity. Then, if one participated, the number of days is modeled. These models can be used to estimate the total number of participants and the total number of days of participation for each activity by regional residents. This information is important as it allows a better understanding of the factors that influence individual recreation choices or behavior. In addition, it allows one to examine how, under the assumption of static tastes and preferences, individual behavior changes over time as underlying factors change. Statistical models were also developed explaining the demand for visits to national forests in the South across the four different types of settings listed above. The second step, or simulation step, combines the estimated models with external projections of relevant explanatory variables to generate estimated per capita participation probabilities and conditional expected days of participation for each activity at 10-year intervals to 2060. Per capita estimates are in turn combined with population projections to derive regional estimates of adult participants and days of participation for each activity. These estimates are then used to create indices by which 2008 baseline estimates of participants for the various activities, found in table 8.1, can be scaled. Indices of estimated adult participants for each of the 10 activities and days of annual participation are presented across the three 2010 Resources Planning Act (RPA) Assessment scenarios described below. For discussion, the activities are grouped into the broader categories as follows: land-based activities, water-based activities, and wildlife (see table 8.1). 10-year intervals to 2060. These estimates are combined with projected population changes to derive indices by which 2008 baseline estimates of visits per site type can be scaled. Indices of estimated visits for each forest site type across each of the RPA Assessment scenarios are presented below. The remainder of the chapter proceeds as follows. First, we present a brief discussion of the statistical methods and previous research upon which our per capita participation, consumption models, and national forest visitation models are based. Next, we describe the data used in the estimation step including projections of covariates for the three assessment scenarios and relevant assumptions. We then present the results of our estimation and simulation steps for regional participation and days projections by activity and assessment scenario to 2060. Similarly, we present projections for visits by each of the national forest site types and assessment scenarios to 2060. Finally, we discuss some of the key findings within and across categories as well as with respect to demographics. Source: NSRE 2005-2009 (n=30,394), U.S. Department of Agriculture Forest Service 2009. Models used to assess recreation demand decisions can be grouped into three basic categories: site-specific user models, site-specific aggregate models, and population-level models (Cicchetti 1973). Population-level modeling is used to address items (a) and (b) above, while site-specific user models are developed to address item (c). Cicchetti (1973) pioneered the use of cross-sectional population-level models with the household-based 1965 National Survey on Recreation and the Environment to estimate annual participation and use nationally for many outdoor recreation activities. Estimated models and Census Bureau projections of socio-demographic variables and population were then used to forecast participation and use to 2000. The cross-sectional population-level approach has subsequently been used to estimate and project participation and use for recreation activities at national and regional levels (Bowker 2001, Bowker and others 1999, Hof and Kaiser 1983a, 1983b, Leeworthy and others 2005, Walsh and others 1992). Alternative approaches, wherein population data were combined with individual site-level data to project participation or consumption have also been used (Bowker and others 2006, Cordell and Bergstrom 1991, Cordell and others 1990, Englin and Shonkwiler 1995, English and others 1993). A major drawback of cross-sectional models, imposed by the nature of the data, is that the structure of the estimated models remains constant over the forecast period. For example, the factors that influence participation or use are assumed to have the same effects throughout the projection period. Hence, barring major shifts in demographics, the results are primarily driven by population growth. This assumption can be tenuous. For example, new sports brought about by technological changes or shifts in tastes and preferences, such as mountain biking, jet skiing, snowboarding, flat-water kayaking, and orienteering are unlikely to be correctly represented in the models. Moreover, if data are collected while activities are in a new or rapid growth phase, recent trends can be potentially very misleading. For example, Cordell and others (chapter 7) report a recent increase in kayaking of 154 percent, something unlikely to be sustained into the future. Nevertheless, without appropriate time-series data, researchers are left with the use of cross-sectional models and their inherent limitations, as a second-best alternative to estimate and forecast participation and use. A further drawback of these models is that it is difficult to account for the dampening effects of future congestion, supply limitations, and price changes on growth in participation and use. where, Pij is the probability that the jth individual participated in the ith recreation activity in the preceding year. The vector Xij contains socio-demographic characteristics unique to activity i for individual j and relevant supply variables for activity i pertaining to individual j’s location (table 8.2), and B represents a vector of parameters which are estimated using NLOGIT 3.0 (Greene 2003). Logistic models for each activity, based on NSRE data from 1999–2008, were combined with 2008 baseline population-weighted sample means for the explanatory variables to create an initial predicted per capita participation rate for each activity. The per capita participation rates were recalculated at 10-year intervals using projected external data. Indices were then created for the participation rates by which the NSRE 2005-09 average population-weighted participation frequencies (baselines) were scaled, leading to indexed per capita participation rates for each of the 10 activities. Indexing the 2005-2009 averages by changes in model-predicted rates was judged to be superior in terms of mitigating potential non-linearity biases associated with complete reliance on logistic predicted values (Souter and Bowker 1996). The indexed participation rate estimates were then combined with projected changes in population, according to each of the three 2010 RPA Assessment scenarios, to yield indexed values for total adult participants across the 10 activities. where, Yij represents the annual number of times or days that individual j participates in activity i, Xj is a vector of socio-demographic characteristics associated with individual j, Qj is a vector of supply relevant variables, and uj is a random disturbance term. These integer or count data models are often estimated using negative binomial specifications with a link function of semi-logarithmic form (Bowker 2001, Bowker and others 1999, Zawacki and others 2000). 10 activities listed in table 8.1. Site specific user models were developed to describe the demand for recreation visits to southern national forests by each of four forest settings: Wilderness, day use developed sites, overnight use developed sites, and general forest area sites. These settings correspond to the sampling strata used to collect all visitor use information in the national forest system (English and others 2002, USDA Forest Service 2010). The data used for the on-site visitation models were obtained from the Forest Service’s National Visitor Use Monitoring Program database for round one and pooled across all national forests in the South. where, Ln Yik is the natural log of annual visits by the ith group to the kth forest, TCik is the travel cost for the ith group to the kth forest, SEi is a vector of characteristics of the ith group, and QSk is a vector of characteristics related to the kth forest. For a more complete discussion of the modeling approach and procedures see Sardana (2010). where, d represents the total differential operator, TVt is the total annual visits in time t, E(Y)t is mean visits per group from the truncated negative binomial model, and POPt is the overall population in time t. As the K’s in (5) are assumed constant, an index of change can be created dividing the first term by the second term in (5) and using the model parameters along with projections of explanatory variables and population for the given time period. Estimates of southern national forest visits by site type for 2008 derived from the National Visitor Use Monitoring Program database can then be scaled by the estimated growth index to derive projections of visits to 2060. County area divided by population. Base 1997. Sum of forest land acres and rangeland acres divided by population at county level and at 50, 100, 200-mile radii. Base 1997. Water acres divided by population at county level and at 50, 100, 200-mile radii. Base 1997. Acres in mountainous divided by population. Base 1997. Percentage of county acres in mountains divided by population (x100000). Base 1997. Sum USFS, NPS, USFWS, BLM, USBR, TVA, and USACE acreage divided by population. Base 1997. Average elevation in meters at county level and 50, 100, 200-mile radii. Base 1997. The results reported in this section combine the models and indexing procedures discussed above with projections of population change, economic growth, and land use change common to three future scenarios from the Forest Service’s 2010 RPA Assessment. The goal of the Assessment is to characterize the common demographic, socioeconomic, and technological driving forces underlying changes in resource conditions in order to evaluate the sensitivity of resource trends to a feasible future range of these driving forces. The use of scenarios links underlying assumptions of the individual analyses and frames the future uncertainty in these driving forces within the integrated modeling and analysis framework of the 2010 RPA Assessment. levels, here the South, to facilitate the resource analyses for the 2010 RPA Assessment. U.S. gross domestic product (GDP) and population projections used in IPCC analyses were updated, and the updated U.S. population and disposable personal income data were then downscaled to the southern county level (USDA Forest Service 2010, Zarnoch and others 2010). 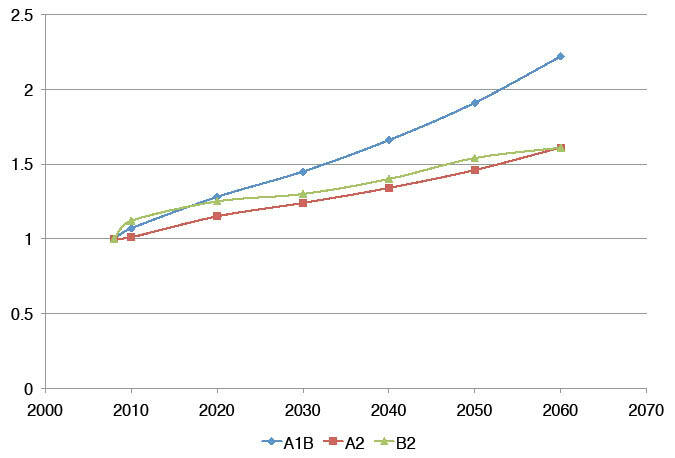 As shown in figures 8.1 and 8.2, A1B corresponds to mid-range population growth and the highest household income level of the three IPCC scenarios. Under this scenario, the South can expect to see about 164 million people (135 million adults) and an average household income of $129,000 by 2060. Scenario A2 projects the highest population growth, reaching about 185 million people (152 million adults) by 2060, and the lowest projected household income, around $91,000. Scenario B2 projects the lowest population growth and mid-level personal income, predicting a population of 145 million people (120 million adults) with average household income about $96,000. In accordance with the assessment scenarios A1B, A2, and B2, projected land use changes are incorporated from Wear (2011) to develop supply variables listed in table 8.2. Nationally, Wear’s projections indicate an increase in urban area of 1-1.4 million acres per year between 1997 and 2060, with a decline in forest area of 24-37 million acres, and decline in cropland of 19-28 million acres by 2060. Wear also projects that about 90 percent of forecasted forest land losses are found in the Eastern United States with more than half in the South. For the South, Wear (chapter 4) forecasts forest acreage losses of 11-23 million acres or about 7-13 percent for Cornerstones based on scenarios A1B and B2. Based on the forecasts of land use change from Wear (chapter 4) across the three scenarios adopted in this chapter, forest and rangeland per capita across the South between 2008 and 2060 is expected to decline about 45 percent under A1B, 50 percent under A2, and about 37 percent under B2. Federal lands and areas covered by water are assumed static throughout the projection period. Further details regarding explanatory variables can be found in chapter 8-appendix A (retrievable at http://www.srs.fs.usda.gov/trends/research/sffpa2010.html). Figure 8.1—Population growth from 2008 to 2060 in the South. Figure 8.2—National Survey on Recreation and the Environment average real household income growth, 2008 to 2060, in the South. 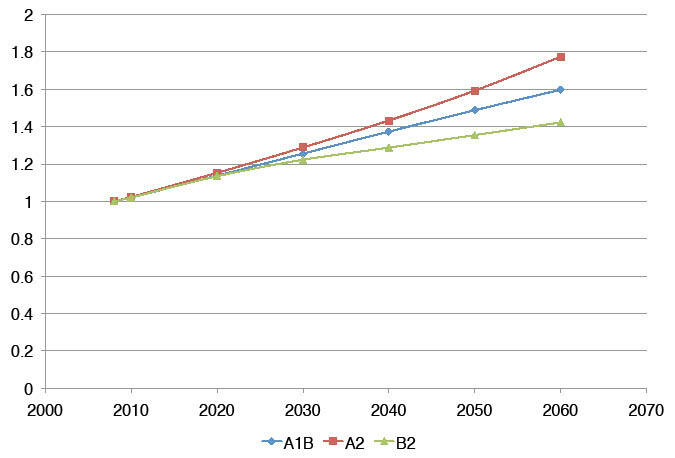 Estimation results for the participation and days models and related projections for A1B, A2, and B2 are reported in chapter 8-appendix A (retrievable at http://www.srs.fs.usda.gov/trends/research/sffpa2010.html). Reported results include model estimates for each activity, values and definitions for explanatory variables by scenario and year, odds ratios which indicate the odds of participation occurring in one group to the odds of it occurring in another group, and graphics of overall participant growth by activity and assessment scenario. Throughout the remainder of this sub-section, we present the results for per capita and overall changes in participation and days of participation by activity and scenario at 10-year intervals from 2010 to 2060. 90 percent over the next 5 decades. Hiking is perhaps the most popular single land-based backcountry activity. In 2008 about 33 percent of adults nationally participated in hiking. In the South, 25 percent of adults participated in hiking totaling about 20 million participants and 463 million days of hiking annually (table 8.4). Among the three assessment scenarios, hiking participation per capita is expected to increase by 12 to 15 percent by 2060, increasing the most under A1B (table 8.4). As the participation rates are similar across scenarios, A2’s higher population growth leads to the greatest increase in hiking participants over the time span, nearly 113 percent, resulting in about 44 million hikers by 2060. Scenarios B2 and A1B led to hiking participant increases from 2008 of about 70 percent and 96 percent, respectively. A notable model result for hiking is that it is the only activity in this chapter for which Hispanic ethnicity is associated with a higher participation rate and higher days per participant than whites (see chapter 8-appendix A retrievable at http://www.srs.fs.usda.gov/trends/research/sffpa2010.html). 100 million days in 2008 to 150-230 million days annually by 2060 (table 8.5). 24 to 48 percent during the same time frame, which is less than population growth. Visiting primitive areas is the final land-based activity examined in this chapter. It is an aggregate, which consists of participating in NSRE activities such as backpacking, primitive camping, and visiting a wilderness, either designated or undesignated. This composite accounted for 28 million participants in 2008, or about 35 percent of all adults in the South (table 8.1). These participants visited primitive areas on 412 million days in 2008. Annual per capita participation in this category is expected to decline by up to 7 percent over the next 50 years (table 8.7). Increased population density and declines in forest and rangeland per capita appear to be factors influencing the participation rate decline (see chapter 8-appendix A retrievable at http://www.srs.fs.usda.gov/trends/research/sffpa2010.html). However, overall participation is expected to increase by 43 to 76 percent across the three scenarios by 2060 because population growth offsets the small decline in participation rates. Annual days of visiting primitive areas per participant is projected to remain nearly constant throughout the simulation period, therefore the growth in total days per year will closely follow adult population growth and range from 44 to 79 percent across the three future alternatives used in this chapter. Water-based activities—Two water-based activity aggregates are examined in this chapter, motorized and non-motorized (table 8.1). Motorized water use includes motor boating, waterskiing, and personal watercraft use. Twenty-seven percent of southern adults, or about 21 million participants, accounted for approximately 384 million days of motorized water use in 2008. Taken separately, these activities all experienced relatively strong growth in participants from 1999 to 2009 (chapter 7). The participation rate for motorized water use is projected to increase by 10 percent to 2060 under scenario A1B, while decreasing by up to five percent under scenarios A2 and B2 (table 8.8). The difference can be attributed to A1B’s higher growth rate for household income which is an important driver of this activity (see chapter 8- appendix A retrievable at http://www.fs.usda.gov/trends/research/sffpa2010.html). Combining the participation rate change with population growth yields projected increases in total participants by 2060 of 48 to 87 percent. Annual days per participant is expected to be stable at 18 days per year under A1B, but decline slightly under A2 and B2. Total days of motorized water use will therefore grow faster than adult population under A1B, but somewhat less than the population under scenarios A2 and B2. By 2060, annual days of motorized water use are expected to grow from 2008 levels by 38 to 86 percent, totaling 528-714 million days annually. Non-motorized water use is an aggregate which includes canoeing, kayaking, and rafting. In 2008 approximately 15 percent or 12 million adults in the South participated in this activity resulting in 80 million days of use (table 8.1). Although rafting grew by just 5 percent between 1999 and 2009, canoeing (39 percent) and kayaking (154 percent) grew dramatically during the same period (chapter 7, table 8.7). Despite rapid growth over the past decade, per capita adult participation in non-motorized water activities is projected to be stable out to 2060, resulting in participant numbers growing at the same rate as the population, or 5-81 percent (table 8.9). This activity is less affected by income than its motorized counterpart. Hence, A2 with greater population growth yields the biggest increase in participants. Days per participant is expected to remain about constant over time at about seven, meaning that the current 80 million days for this activity will increase to 115-141 million days by 2060. Wildlife-based activities—Three wildlife activities are assessed in this chapter: birding, fishing, and hunting. Birding, a non-consumptive activity, consists of viewing or photographing birds. This activity is very popular in the South, involving 34 percent of the adult population or 27 million people. Among all the activities in this chapter, birding, at 106, has the highest annual days per participant (table 8.1) accounting for about 2,900 million days annually. This extremely high value is likely reflective of the many levels or intensities of birding, from watching feeders to pursuing sightings in remote forests or along the coast. Cordell and others (chapter 7) report that birding participation increased by nearly 30 percent from 1999 to 2009. Per capita participation in birding is projected to increase 7 to 10 percent over the next five decades meaning that birders will increase faster than the adult population at large across each of the future scenarios used herein (table 8.10). By 2060 birding participants are projected to number 44-56 million in the South. Days per participant are expected to decline by 9-13 percent over the same time period. This decline will mean that the total number of days per year of birding by Southerners will increase marginally less than the population, or 47-75 percent by 2060. Fishing, as defined here, is a composite including various types of saltwater and freshwater pursuits. Fishing has the second highest participation rate (36 percent) for Southerners among the activities examined in this chapter. In 2008, approximately 28 million anglers accounted for 572 million days of participation (table 8.1). Fishing participants increased in the South by over 20 percent in the past decade (chapter 7, table 8.7). Across each of the futures scenarios used in this chapter, the fishing participation rate is projected to decline by 10 to 18 percent over the next five decades (table 8.11). Thus, the number of Southern anglers will grow slower than the regional population. Projected growth rates for participants of 32-54 are expected. Days per participant will remain at about 20 per year across A1B, A2, and B2. Therefore, the number of days of fishing is expected to grow considerably slower than the population, or 30-51 percent. Nevertheless, fishing will remain among the top recreation activities in the South accounting for 742-859 million days in 2060. Hunting is the final activity examined in this section. Here, hunting consists of an aggregate including all types of legal hunting, including big game, small game, waterfowl, and varmint. Approximately 10 to 11 million adults in the South, or over 13 percent, reported hunting in 2008 on a total of 230 million days (table 8.1). Cordell and others (chapter 7) report that small game hunting participants increased by 16 percent, and big game hunters increased by 25 percent from 1999 to 2009. Findings from our models, suggest that per capita participation by southerners in hunting has peaked and will decline by 26-42 percent over the next five decades (table 8.12). A number of factors appear to be driving the participation rate decline including: increasing population density, growth in Asian and Hispanic population proportions, increasing levels of education, and declining forest and rangeland per capita (chapter 8-appendix A retrievable at http://www.fs.usda.gov/trends/research/sffpa2010.html). Despite the declining participation rate, the number of southern hunters is expected to increase out to 2060 by 8 to 25 percent for scenarios B2 and A1B, respectively (table 8.12). Days of participation per hunter, currently around 22, is projected to remain relatively constant regardless of the selected future scenario. Total days of hunting are forecast to grow at about the same rate as hunter numbers, by 8-24 percent. By 2060 the southern adults will account for 248-286 million days of hunting annually. Estimation results for visits to southern national forests and related projections for A1B, A2, and B2 are reported in appendix B (retrievable at http://www.srs.fs.usda.gov/trends/research/sffpb2010.html). Reported results include on-site visitation model estimates for each of the four site types, values for explanatory variables by scenario and year, population projections and site visit indexes. Beginning with over 30 million site visits annually in 2008 (table 8.13), we present the results for annual visits per group and overall changes in total Southern national forest visitation by site type and scenario at 10-year intervals, from 2010 to 2060. Developed use day sites—Visitation to developed use day sites is the second most popular of site types encountered in Southern national forests accounting for 6.5 million recreation visits in 2008. Depending on the specific national forest, these sites include some combination of built structures including picnic areas, playgrounds, shelters, boat ramps, toilets, parking lots, and the like. Groups visiting developed use day sites averaged more than 12 person-trips per year (e.g., a family of four traveling to the site 3 times per year). Annual visits per group are projected to decline 5-8 percent by 2060 across the three scenarios used in this chapter (table 8.14). However, as population is forecast to increase with each scenario, visits to developed use day sites are projected to rise by 35 percent under the lower population growth of B2, 47 percent under mid-population growth A1B, and by approximately 70 percent under scenario A2 wherein population is expected to increase by 77 percent. Overnight use developed sites—As the name implies, overnight use developed sites have facilities which accommodate overnight stays such as cottages, recreation vehicle hook-ups, camp sites, electricity, and running water. Southern national forests experienced about 2.3 million visits to these sites in 2008 (table 8.13). Annual visits per group averaged around 10, and are projected to decline by 7 percent under A2 and by 14 percent under scenario A1B. However, because of forecasted population growth, an increase of 30 percent (B2) to 64 percent (A2) in visitors to these sites is projected (table 8.15). Wilderness—Recreation visits to designated Wilderness sites in southern national forests totaled 826,883 in 2008 (table 8.13). Annual visits per group averages over 14 and is expected to decline slightly 3 to 5 percent over the next five decades (table 8.16). This relatively stable per group annual visitation rate, when combined with population growth, suggests that Wilderness visits to southern national forests will grow the most among the four site types, between 38 percent (B2) and 72 percent (A2). Despite faster relative growth in visits, Wilderness visits will remain the smallest in absolute terms, totaling 1.1-1.4 million visits annually by 2060. General forest areas—Visits to general forest areas in southern national forests, at almost 23 million in 2008, greatly exceed recreation visits to the other three site types combined. General forest areas are probably the most like private forest lands in that while they often have trails and forest roads, they generally lack maintained facilities of any type. Like Wilderness, the average annual visits per group to general forest areas is approximately 14. Unlike Wilderness, though, this average per group is projected to decline by 12-24 percent by 2060 (table 8.17). The biggest decline comes with scenario A1B and this is primarily driven by the effect of increased household income. Like the other national forest settings, the increase in population over the next five decades offsets the drop in average visits per group yielding increases in annual visits by 2060 of 22 percent for A1B and B2, and 55 percent for A2. By scenario, the relative increases are less than for each of the other site types. However, in total, the average visits across the various site types in 2060 is still substantially more than the combination of the other three (table 8.13, figure 8.3). Table 8.13—National forest visits in the South by site type as counted in 2008 and as projected for 2060 (averages per Resources Planning Act scenarios A1B, A2, and B2). Source: U.S. Department of Agriculture Forest Service 2010. Figure 8.3—Southern national forest visits (thousands) by site-type, 2008 to 2060. This chapter developed models to explain outdoor recreation participation and days of participation for residents of the Southern United States. Models were also developed to examine visits to national forests in the South. These models, combined with population, socioeconomic, and land use projections from alternative futures were employed to project the number of outdoor recreation participants and days of participation regionally to 2060, and to project the number of southern national forest recreation visits by site type to 2060. The objectives were to first, evaluate how population growth and changing demographics will affect changes in demand for different types of recreation activities, and second, to examine the potential for increased congestion and conflict among recreational users of forests as a result of changing supply and demand factors. Regarding the first objective, the preceding results section indicates that in general, despite continued losses in forest and rangeland across the region and changing demographics, outdoor recreation activity will continue to grow in both numbers of participants and days of participation. Generally, speaking, the number of projected participants and days of participation will increase at a rate near or somewhat below the rate of growth of the regional population. For a few activities, such as developed site use, hiking, and birding, participant numbers as well as days of participation are projected to grow faster than the rate at which the regional population grows. Other activities typically associated with higher income, like horseback riding on trails, motorized water use, and non-motorized water use, will grow faster than the population if the higher income conditions of scenario A1B eventuate. Otherwise, they will grow at rates slightly less than the population. A few activities, such as fishing, hunting, and motorized off-road use are projected to experience substantial declines in participation rates and thus, while increasing, will grow much slower than the growth rate of the regional population. Hunting and motorized off-road use, being relatively land intensive, are adversely affected by the expected decline in available forest and rangeland. Moreover, these activities are essentially counter-cultural to the growing numbers of ethnic minorities in the region. Annual visits per group to southern national forests will decline across all site type and scenario combinations. For day use developed sites, overnight use developed sites, and Wilderness sites, these declines are virtually all less than 10 percent. Thus, when visits per group are combined with an increasing number of groups due to population growth, overall national forest visits will grow, slightly lagging regional population growth. However, visits to general forest areas, which comprise about 70 percent of all national forest visits in the South will grow noticeably slower than the regional population, albeit still increasing by 22-55 percent. The second objective was to examine the potential for increased congestion and conflict among recreational users of forests as a result of changing supply and demand factors. While modeling use for specific activity and site combinations was beyond the scope of this chapter, tables 8.18 and 8.19 can be used to broadly assess the potential for congestion and conflict facing forest recreationists as demand and supply factors change over the next five decades. Two measures of density and change are reported in table 8.18—forest and range acres per participant, and days of participation per forest and range acre. With the exception of hunting, forest and range acres per participant are projected to decline over the next decade by 33-50 percent. For hunting the decline will be from 11 to 26 percent. For developed site use and hiking, this could begin to strain existing infrastructure necessary for such activities. For birding and hiking, as defined in the NSRE, these may or may not require expansive areas for quality experiences. The activities currently taking place on the largest amount of space, e.g., horseback riding on trails, hunting, and motorized off-road use, while experiencing somewhat smaller changes in acres per participant, may actually “feel” more congested given the nature of the activity, particularly hunting. It should also be noted that across the three futures scenarios (A1B, A2, and B2), A1B which has the highest income growth, middle land conversion, and middle population growth led to the most “congestion” by the loss in forest and range land per participant measure. An alternative measure of congestion or land impact—annual days of use per forest and range land acre—is also presented in table 8.18. This measure is perhaps better to assess the impact of activities on nature as it combines participant number and participant intensity per unit of land area. Congestion per unit of land is will rise most over the next five decades for horseback riding on trails (151 percent) and hiking (118 percent). Hunting will see the smallest increase (13-34 percent). These measures are not intended to be comparable across activities, and some may actually have a social component, and thus increase user utility with increased congestion—up to a point. Nevertheless, for those activities which may be near biological carrying capacity or infrastructure carrying capacity, the large increases in use per acre could be a concern, both for the land and for the user. A final measure of congestion—visits per acre to southern national forests by site type—is reported in table 8.19. Wilderness visits per acre appear to be facing the biggest increases in potential congestion with visits per acre increasing from 38 to 72 percent. Increases across the various scenarios suggest that the density of Wilderness visits in 2060 will exceed that of general forest area visits today. This increase could present difficult challenges to Wilderness and protected area land managers. For example, it is generally understood that an important motivation for visiting Wilderness is to “get away from civilization” or experience nature “untrammeled by man.” Having this type of experience will be challenging if Wilderness visitor density continues to increase. In order to accommodate visitor satisfaction, and to comply with Wilderness legislation, managers may be faced with the potentially unappealing prospect of regulating access in the future. General forest area use density is expected to rise by 22 percent (A1B, B2) to 55 percent (A2) as national forests likely become even more of a substitute destination as private forest and range land is reduced by further development. Because general forest area recreation use including hunting, motorized off-road use, and horseback riding on trails generally require more space between users for high-quality (and safe) experiences, this increase in use density should also be of concern to national forest managers. For example, conflicts due to congestion may increase not just within activities (e.g., motorized off-road users running into each other figuratively and literally), but across activities (e.g., motorized off-road users scaring away game sought by hunters and spooking horses). As in the case of Wilderness, managers could be faced with choosing among potentially unpopular access regulation schemes to mitigate congestion conflicts. Managers may also need to consider sectioning general forest areas into special use areas for specific activities such as motorized off-road use, horseback riding on trails and hunting in order to reduce cross-activity congestion conflicts. Regardless, the increased congestion can only increase the impacts of recreation on the forest environment. Across all activities and venues, private and public, this chapter provides strong evidence to suggest that the number of southern outdoor recreation participants and their annual days of use will continue to grow over the next five decades putting increasing pressure on existing infrastructure, both built and natural, thus stressing the recreation carrying capacity of the forest and range land resources. In some cases, it may be possible to relieve congestion problems by investing in and building more infrastructure, e.g., constructing more hiking trails on public lands. Private land owners may also help to meet increased demand by increasing built recreation infrastructure on private lands. In the South, there has historically been a fairly large market for consumptive recreational activities (e.g., hunting) provided on private lands. In the future, owners of remaining private land may also be able to “cash in” on increased demand for non-consumptive recreational activities by investing in recreation infrastructure traditionally provided by public lands (e.g., hiking trails, bird-watching facilities). Because of increasing visitors per acre resulting from increasing population and decreasing private forest and range land, remaining private land will likely become more valuable for other recreation uses including overnight developed site use and developed site day use. A portion of private land in the South is already devoted to private developed campgrounds which have sprung up over the past several decades in response to increased demand for camping opportunities and limited public campgrounds, particularly public campgrounds with RV hook-ups. Increasing congestion on public lands in the future may provide increased demand for private campgrounds and incentives for private land owners to invest in private, overnight developed site infrastructure. NSRE data suggest that some ethnic minority populations in the South participate in activities occurring at public day use developed sites such as family gatherings and picnicking in greater proportions than traditional visitors. Thus, as the ethnic minority populations in the South increase to 2060, public day use developed sites and hiking venues are likely to become even more congested leading to visitor competition and conflict over limited facilities (e.g., limited picnic pavilions). Public land managers can respond by devoting more public land and management budgets to day use developed sites. Because increasing scarcity of public day use developed sites will increase the value of private land for day use developed sites, private land owners may have incentives in the future to invest in day use developed site infrastructure such as picnic area pavilions to rent out for profit. It is impossible to see exactly how changes in income, socioeconomic factors, and economic development will affect the supply and demand for forest-based outdoor recreation. The models, results, and conclusions presented in this chapter are predicated on a number of assumptions and relationships that are likely to change with time. People’s preferences change over time. New technology will bring changes to how people enjoy the outdoors—and how they avoid the outdoors. Activities like snowboarding, mountain biking, flat water kayaking, and orienteering did not appear on the radar when Cicchetti’s seminal forecasting work on national recreation use was published in 1973, nor did activities like video gaming and DVD renting. Despite differences in outdoor recreation and consumption across ethnic lines today, acculturation factors may mask such differences over the course of the next five decades. Regardless, as the population grows, it is likely that outdoor recreation pressure on the natural environment will become more prevalent and management will need to find ways of creatively mitigating this pressure. We are grateful to Carter Betz, Don English, Shela Mou, Meghan Starbuck, Kavita Sardana, and Stan Zarnoch for various helpful insights and technical assistance. projections 2000-2020. Gen. Tech. Rep. PNW-GTR-527. Portland, OR: U.S. Department of Agriculture Forest Service, Pacific Northwest Research Station. 28 p.
Bowker, J.M. ; Bergstrom, J.C.; Gill, J. 2007. Estimating the economic value and impacts of recreational trails: a case study of the Virginia Creeper Rail Trail. Tourism Economics. 13: 241-260. Bowker, J.M. ; English, D.B.K. ; Cordell, H.K. 1999. Outdoor recreation participation and consumption: projections 2000 to 2050. In: Cordell, H.K. ; Betz, C.J. ; Bowker, J.M. [and others]. Outdoor recreation in American life: a national assessment of demand and supply trends. Champagne, IL: Sagamore Press, Inc.: 323-350. Bowker, J.M. ; Starbuck, C.M. ; English, D.B.K. [and others]. 2009. Estimating the net economic value of national forest recreation: an application of the National Visitor Use Monitoring database. Faculty Series Working Paper, FS 09-02. Athens, GA: The University of Georgia, Department of Agricultural and Applied Economics. 222 p. http://ideas.repec.org/p/ags/ugeofs/59603.html. [Date accessed: December 4, 2012]. Bowker, J.M. ; Murphy, D.; Cordell, H.K. 2006. Wilderness and primitive area recreation participation and consumption: an examination of demographic and spatial factors. Journal of Agricultural and Applied Economics. 38(2): 317-326. Cameron, C.A. ; Trivedi, P.K. 1998. Econometric society monographs: regression analysis of count data. New York: Cambridge University Press. 412 p.
Cicchetti, C.J. 1973. Forecasting recreation in the United States. Lexington, MA: D.C. Heath and Company. 200 p.
Cordell, H.K. ; Bergstrom, J.C.; Hartmann, L.A.; English, D.B.K. 1990. An analysis of the outdoor recreation and wilderness situation in the United States: 1989–2040. Gen. Tech. Rep. RM-189. Fort Collins, CO: U.S. Department of Agriculture Forest Service, Rocky Mountain Forest and Range Experiment Station. 112 p.
Cordell, H.K. ; Bergstrom, J.C. 1991. A methodology for assessing national outdoor recreation demand and supply trends. Leisure Sciences. Englin, J.E. ; Shonkwiler, J.S. 1995. Estimating social welfare using count data models: an application to long-run recreation demand under conditions of endogenous stratification and truncation. Review of Economics and Statistics. 77(1): 104-112. English, D.B.K. ; Betz, C.J. ; Young, J.M. 1993. Regional demand and supply projections for outdoor recreation. Gen. Tech. Rep. RM-230. Asheville, NC: U.S. Department of Agriculture Forest Service, Southeastern Forest Experiment Station. 39 p.
English, D.B.K. ; Kocis, S.M. ; Zarnoch, S.J. ; Arnold, J.R. 2002. Forest Service national visitor use monitoring process: research method documentation. Gen. Tech. Rep. SRS-57. Asheville, NC: U.S. Department of Agriculture Forest Service, Southeastern Forest Experiment Station. 14 p.
Greene, W.H. 2003. NLOGIT. Version 3.0. Plainview, NY: Econometric Software, Inc.
Hall, T.E. ; Heaton, H.; Kruger, L.E. 2009. Outdoor recreation in the Pacific Northwest and Alaska: trends in activity participation. Gen. Tech. Rep. PNW-GTR-778. Portland, OR: U.S. Department of Agriculture Forest Service, Pacific Northwest Research Station. 108 p.
Hof, J.G. ; Kaiser, H.F. 1983a. Long term outdoor recreation participation projections for public land management agencies. Journal of Leisure Research. 15(1): 1-14. Hof, J.G. ; Kaiser, H.F. 1983b. Projections of future forest recreation use. Resour. Bull. WO-2. Washington, DC: U.S. Department of Agriculture Forest Service. 12 p.
Intergovernmental Panel on Climate Change [IPCC]. 2007. Climate change 2007, the fourth IPCC assessment report. http://www.ipcc.ch/publications_and_data/ar4/syr/en/contents.html. [Date accessed: December 10, 2008]. Leeworthy, V.R. ; Bowker, J.M. ; Hospital, J.D. ; Stone, E.A. 2005. Projected participation in marine recreation: 2005 and 2010. http://www.srs.fs.usda.gov/pubs/ja/ja_leeworthy002.pdf. [Date accessed: August 31, 2010]. Ovaskainen, V.; Mikkola, J.; Pouta, E. 2001. Estimating recreation demand with on-site data: an application of truncated and endogenously stratified count data models. Journal of Forest Economics. 7(2): 125-144. Sardana, K. 2010. Modeling demand for outdoor recreation settings with choice-based samples. Athens, GA: University of Georgia. 61 p.
Souter, R.A.; Bowker, J.M. 1996. A note on nonlinearity bias and dichotomous choice CVM: implications for aggregate benefits estimation. Agricultural and Resource Economics Review. 25(1): 54-59. U.S. Department of Agriculture (USDA) Forest Service. 2012. Future scenarios: a technical document supporting the forest Service 2010 RPA Assessment. Gen. Tech. Rep. RMRS-GTR-272. Fort Collins, CO: U.S. Department of Agriculture Forest Service, Rocky Mountain Research Station. 34 p.
U.S. Department of Agriculture (USDA) Forest Service. 2010. National Visitor Use Monitoring Program: FY 2009 NVUM national summary report. www.fs.fed.us/recreation/programs/nvum/. [Date accessed: August 21, 2010]. U.S. Department of Agriculture (USDA) Forest Service. 2009. National Survey on Recreation and the Environment (NSRE dataset, various years). Athens, GA: U.S. Department of Agriculture Forest Service, Southern Research Station, RWU-4953. http://www.srs.fs.usda.gov/trends/nsre-directory/index.html. [Date accessed: December 4, 2012]. Walsh, R.G. ; Jon, K.H. ; McKean, J.R.; Hof, J. 1992. Effect of price on forecasts of participation in fish and wildlife recreation: an aggregate demand model. Journal of Leisure Research. 21: 140-156. Zarnoch, S.J. ; Cordell, H.K. ; Betz, C.J. ; Langner, L. 2010. Projecting county-level populations under three future scenarios: a technical document supporting the Forest Service 2010 RPA Assessment. e-Gen. Tech. Rep. SRS-128. Asheville, NC: U.S. Department of Agriculture Forest Service, Southern Research Station. 8 p.
Zawacki, W.T. ; Marsinko, A.; Bowker, J.M. 2000. A travel cost analysis of economic use value of nonconsumptive wildlife recreation in the United States. Forest Science. 46(4): 496-505. J.M. Bowker is a Research Social Scientist, U.S. Department of Agriculture, Forest Service, Forest Sciences Laboratory, Athens, GA 30602; Ashley E. Askew is a Doctoral Candidate, University of Georgia, Department of Statistics, Athens, GA 30602; H. Ken Cordell is a Pioneering Research Scientist, U.S. Department of Agriculture, Forest Service, Forest Sciences Laboratory, Athens, GA 30602; John C. Bergstrom is a Professor, Department of Agricultural and Applied Economics, University of Georgia, Athens, GA 30602.